It is rare to find a villa for rent in Rome, let alone accommodations for 12, and this elegant gem beautiful gardens set around a private swimming pool. 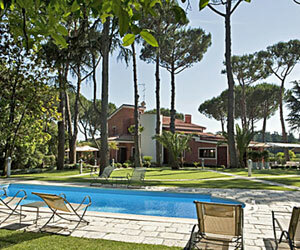 This is very special villa for your special Roman holiday. You are just 15 minutes to the Piazza Navona and Spanish Steps yet tranquil and quiet to repose in tranquility. Option to rent with limited or full staff that are happy to arrange whatever you desire during your visit: special VIP private tours, spa massages, personal trainer, activities and unusual tours catered to children. Ideal for those wanting a luxury style hotel but the privacy of a villa. Perfect for weddings and special occasion gatherings. Surprisingly child friendly, not only a fantastic swimming pool, but your concierges can arrange a treasure hunt in Old Rome discovering The Eternal City in a different light, or spend the day at home swimming in the pool and enjoying an amusing and fun filled cooking classes, or a children's museum with activities that will want them returning again and again. After dinner a view of the stars at a nearby planetarium can be arranged by your concierge. Enter the villa from the main entrance into the foyer. To your right is the large and spacious double living room with multiple areas to relax. The Grand piano is off to one side, and then two large spacious living rooms, one with a fireplace and flat screen TV, the other leads out to the gardens. To the left is the professional kitchen with large peninsula for prepping and cooking if you wish to spend time cooking. Otherwise your chef will be happy to prepare a meal and you are invited to sit casually in the kitchen and watch or help, whatever you prefer! Across the hall from the kitchen and adjacent to the living room is the fabulous 60's inspired dining room that will seat 12 comfortably. Off of the same hall way is the first en suite bedroom, this one a king size bed with en suite with bath. At the end of the hall way is a game room ideal for playing cards or just relaxing. An impressive wide marble staircase takes you up to the first floor, or you can use staircase off of the hallway. At the top of the landing is a Twin/King ( can be joined on request ) bedroom with en suite bath with shower. The spiral staircase side of the villa takes you to a large Twin Bedroom ( beds cannot be joined) with sitting area and an en suite bathroom that is just down the hall. A doorway from the hall way guarantees your privacy. This bedroom has direct access to the gardens from the marble staircase. Twin/King ( can be joined on rqeust ) bedroom with en suite bath with tub. The marble staircase takes you down to the Recreation room. Here you have a large game room with billiard table, sofa and chairs for watching TV, a Fitness Room, Guest bathroom and laundry room with washing machine, dryer, iron and ironing board. Villa Roma has a gated entrance that leads to a nice stone paved driveway. You can follow the driveway to a car park that can accommodate 6 cars or continue on, to circle around the property back to the gate. The nicely manicured lawn dotted with both palm and pine trees is a refreshing oasis in the midst of the city. It includes a children's playground area, a wonderful area for children to play and wide open lawns that give you obstructive views to keep an eye on them. The private in ground pool has lounge chairs and sun shades. The villa also offers two outdoor dining areas. One is located off of the kitchen area giving you a great place to enjoy your breakfast and the other, which has a gas BBQ grill, can be accessed from the living room area. Twin bedroom ( can not be joined) with bath room with shower situated in the hall that is closed off by a door so it is completely private and considered en suite. Private Inground Pool, Air Conditioning, Fireplace, Pets Okay, Central Heat, No Smoking, Bikes Available, Maid Service, Driver, Cook Available, Villa Roma is equipped with a Recreation / FitnessFloor that includes fitness room including Treadmill, Bicycle, and Bench Weights. This area also has a Billiard Table and cue sticks, guest bathroom and laundry. Security Deposit can be paid at the time of final payment in USD equivalent and returned no later than 30 days after your departure or E4900 can bepaid on arrival in cash euro or credit card and refunded after check out.a larger security deposit for events will be based on the event held. Spanish Steps 18 minute by Taxi, 1 hour 21 minute walk. The Villa has arranged VIP taxi service with a local company which has wifi service and accepts credit cards.